Here’s a picture of Harley the cat. He’s not mine. He’s my neighbor’s. But … I buy cat food for him. He’s waiting for me with a loud MEOW when I get home. He has claimed my lap as his personal napping arena. He sleeps on our couch. 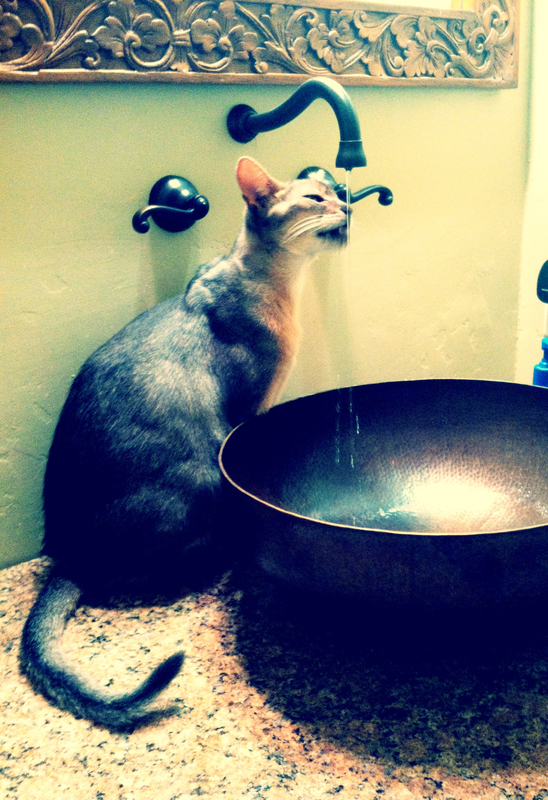 He refuses to drink water from a bowl, and demands it from our dribbling bathroom faucet, as you can tell from the picture. The internet is full of cute cat pictures, and now I have contributed my share. If you’re pregnant and have a cat, you have hopefully heard not to change the litter box. The reason: a little parasite called Toxoplasma gondii. This parasite can cause an infection called toxoplasmosis. Most humans with normal immune systems can fight its spread to keep the infection dormant. You may have the parasite and not know it. The problem for a pregnant women: if she becomes infected during pregnancy, the parasite easily crosses the placenta to infect the growing fetus. A growing fetus does not have the mature immune system to fight off the infection, and can develop long term, debilitating problems: intellectual disability, seizures, muscle spasms or weakness, severely impaired vision, and deafness. The best way to prevent this infection? Avoid the parasite! Cats play a big part in the spread of Toxoplasma gondii. They eat small rodents and birds that may be infected. The parasite is shed in cat feces for up to 3 weeks after that initial infection. Cats poop in litter boxes and garden soils, where the parasite can stay and be spread, even contaminating water sources. You ingest it. In temperate climates (hello California), ingesting the parasite through undercooked or cured meat, or meat products, is the most common way. Pork, lamb, and venison, especially. Soil contaminated fruits and vegetables is a source. People can also become infected if they accidentally swallow the parasite after being in contact with cat feces (gross, I know, but it does happen). About 1-8 women in 1000 susceptible pregnancies. The highest reported rates are in France, where pregnant women are tested routinely. The parasite is not so common in US (so is not a routine test for prenatal care). With a healthy immune system, if you already have the parasite when you get pregnant, it shouldn’t affect the growing fetus (because your immune system is helping keep it dormant). If you get a new infection, the symptoms are usually vague: fatigue, fever, headache, malaise (overall feeling like crap). You would probably see your doctor if you felt like this during pregnancy anyway. Let them know if you think you’ve been exposed to the parasite. Have someone else change the CAT’S LITTER BOX. Change it every day. Cat feces aren’t infectious the first day, but become more infectious the longer they sit around. AVOID ingesting any type of SOIL. Wash hands thoroughly after touching soil (like when gardening). Wash fruits and vegetables carefully (get all that dirt off). Always drink FILTERED WATER, in ALL settings. Don’t taste meat while cooking – make sure it is cooked thoroughly before you eat it! Follow strict kitchen hygiene. Use separate cutting boards for meats, which you wash thoroughly each time. Kill the parasite in meat by either cooking meat to 152 degrees F, or freezing meat for a full 24 hours. There is weak evidence that meat that has been smoked or cured is not safe. The risk is higher if the drying and curing time was limited. SHELLFISH may be able to transmit the parasite too, but there isn’t a ton of evidence, and the CDC doesn’t recommend avoiding it because of toxoplasmosis. Overall, the most important thing you can do is WASH YOUR HANDS – after cooking, gardening, anything. This is the way to prevent transmission! Lastly, Toxoplasma gondii is much more prevalent and virulent in South America, so plan your vacay to Rio de Janeiro for some other time.